H.R. 2121 has been introduced in the House of Representatives, and subsequently referred to the House Committee on Financial Services, to amend the Secure and Fair Enforcement for Mortgage Licensing Act of 2008 (S.A.F.E. Act). The proposed amendment, sponsored by Representative Steve Stivers (R-OH), would amend the S.A.F.E. 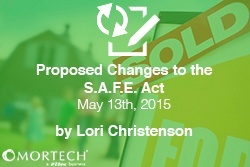 Act to include an additional subsection referring to employment transition. If passed, it would allow a Nationwide Mortgage Licensing System and Registry (NMLS) registered loan originator a temporary license, good for a 120-day period, for those moving between financial institutions or to another state. The S.A.F.E. Act, enacted on July 30, 2008, created a Federal registration system for individuals acting as mortgage loan originators who are employed by Agency-regulated institutions. The registry was established in January of 2011 and required loan originators to register between January 31, 2011 and July 29, 2011. As of July 29, 2011, if a loan originator, employed by an Agency-regulated institution subject to the requirements, has not registered, they are prohibited from originating residential mortgage loans. Currently, the S.A.F.E. Act allows for a 60-day grace period for changes in employment due to acquisitions, mergers, and reorganizations. All other situations do not allow for a grace period and require the employee to provide required attestation and authorization, as well as submit new fingerprints (unless the fingerprints on file are less than three years old) prior to acting as a mortgage loan originator.